In today’s video, we’re looking back at a few of our older fashion posts. From our first ever fashion post where we created Valentine’s Day looks and posed awkwardly in front of Lauren’s bedroom wall, using a dodgy camera to shoot the images. Yeah it’s pretty embarrassing for anybody to see themselves doing something three years ago, but what’s worse is that we had some tragic posts even more recently! 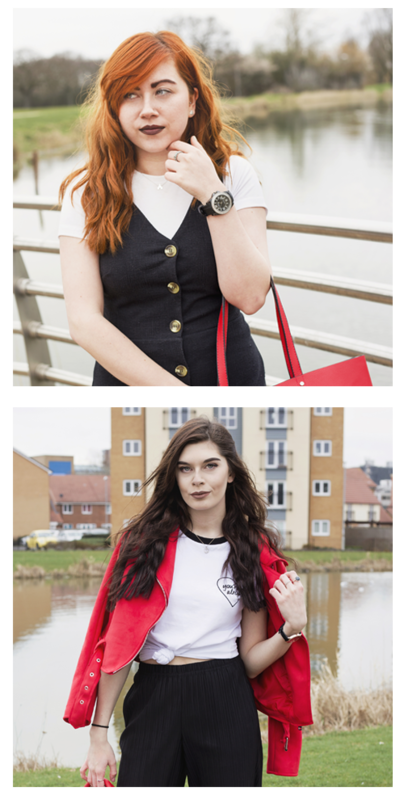 From our matching pinafore outfits and Lauren’s snapback fashion faux pas in 2016, even to last January with our half-hearted and gloomy looking “January Jumper Edit”. But one thing about us two is that no matter how embarrassing something is, we just like to laugh it off! We like to think we’ve improved a lot over the years, not just with our outfits choices and our makeup skills but also with the quality of our photos and our writing. As much as we find it funny to look back at our old posts, it’s also really nice to see where we once were and how much we feel we’ve progressed with our blog. Our aim with this video was to make you laugh and cringe with us even just a tiiiiny bit and we hope we did just that! If you enjoyed watching, please do let us know! Have you had any questionable fashion choices in the past? « Red Alert | Our New Favourite Colour?